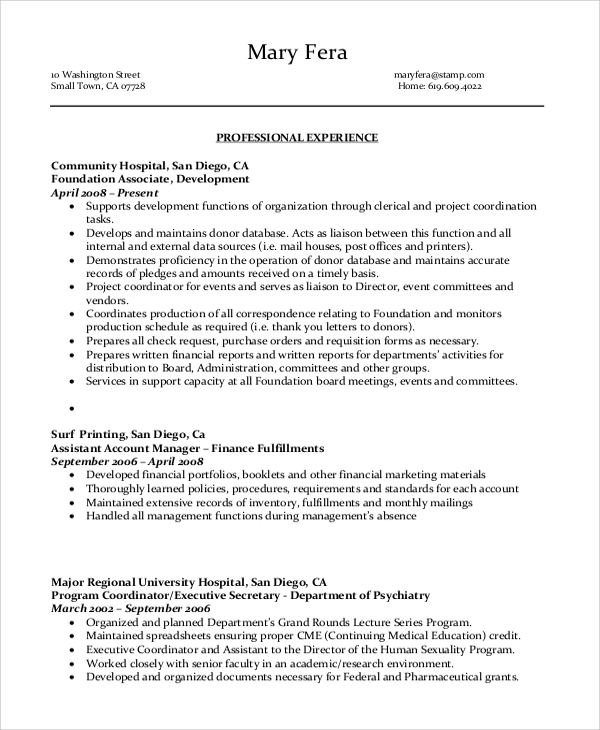 Resumes are mandatory while applying for any job post. Different categories of job posts require different types of resumes and writing styles. The following Resume Samples are for applying for administrative assistant posts. They are various types of administrative posts available, and the following samples serve the purpose of preparing resumes for all of them effortlessly. 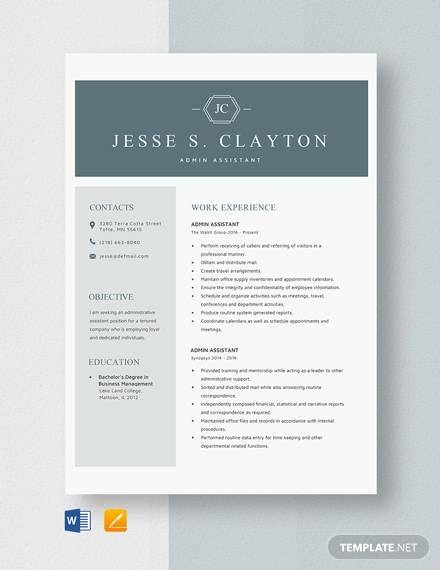 They are fully editable and have beautiful layouts and templates to create resume instantly. This is a perfect resume sample for a legal administrative assistant. The layout is creative. It highlights the areas of expertise, professional and personal skills. It has a summary and a detailed list of work experiences and responsibilities performed. Other than those, there are provisions for academic qualifications and references. 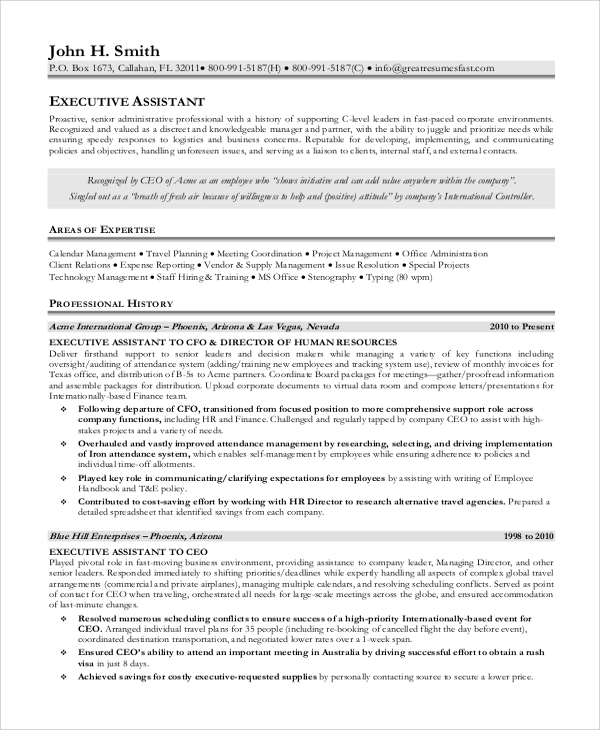 This is a professional looking executive administrative assistant resume. It contains an executive summary, followed by areas of expertise in bulletin points. Then it moves on to the history of professional work with labels of the organizations and timelines representation. 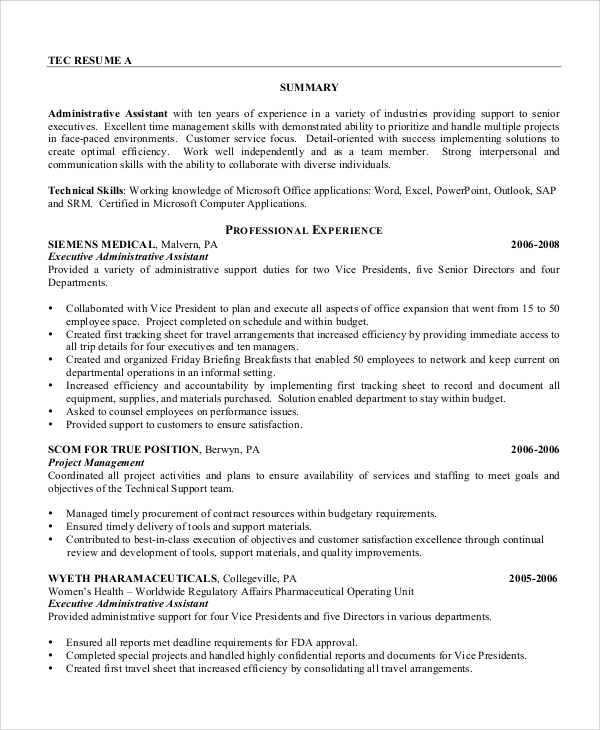 This resume sample is to apply for the post of medical Administrative Assistant. It is clean and well-structured. It highlights the expertise amazingly. It has qualification summary, relevant professional experience details and list, personal details and other necessities. Administrative assistant resumes will reflect the qualities of the applicant when it comes to creativity, presentation and writing skills. It is a medium to impress the interviewer and score over the competitors for the post applied for. Such resumes have to be to the point, brief and need to contain all the required information in the most presentable way. 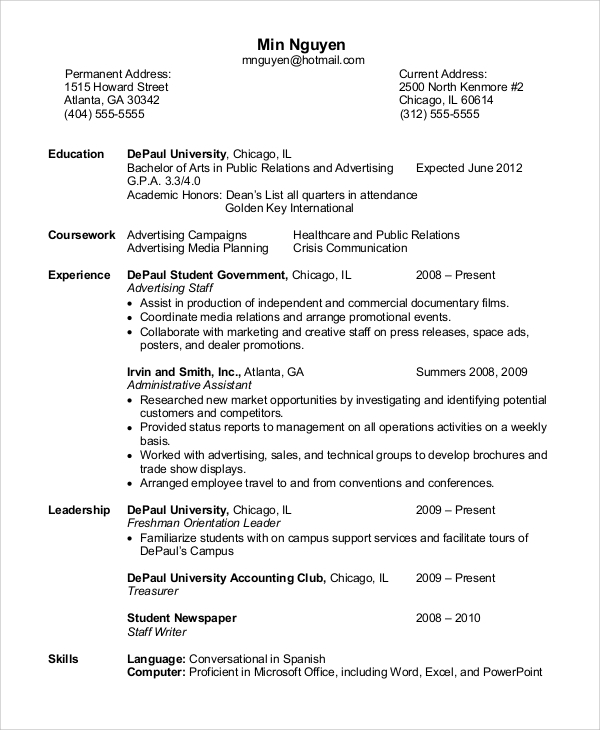 The above-listed resumes will give you the perfect idea on how an Administrative Assistant Resume should look like. 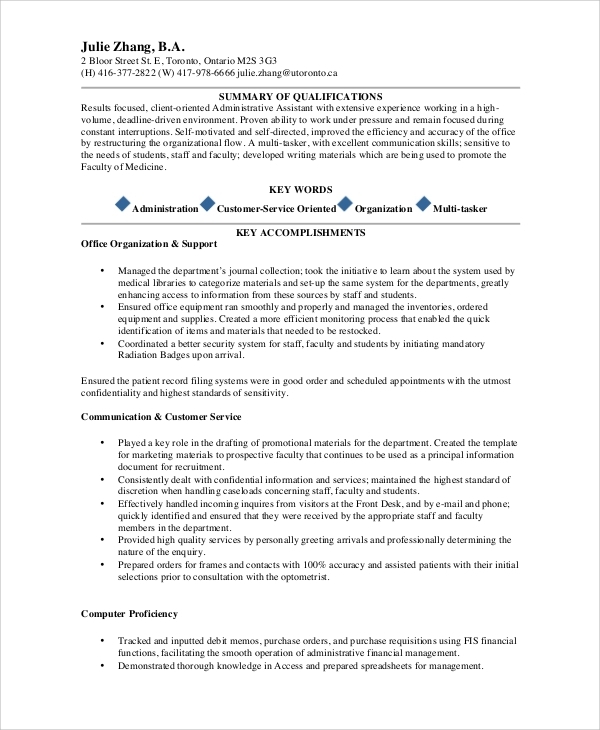 This is a manual on how to prepare a professional and outstanding resume for an entry level administrative assistant. It states the key elements for a resume to be successful, the actions, verbs, and the skills needed to highlight, the chronology and flow of the resume and other relevant parameters. It also has a lot of samples and illustrations to make the points clear. 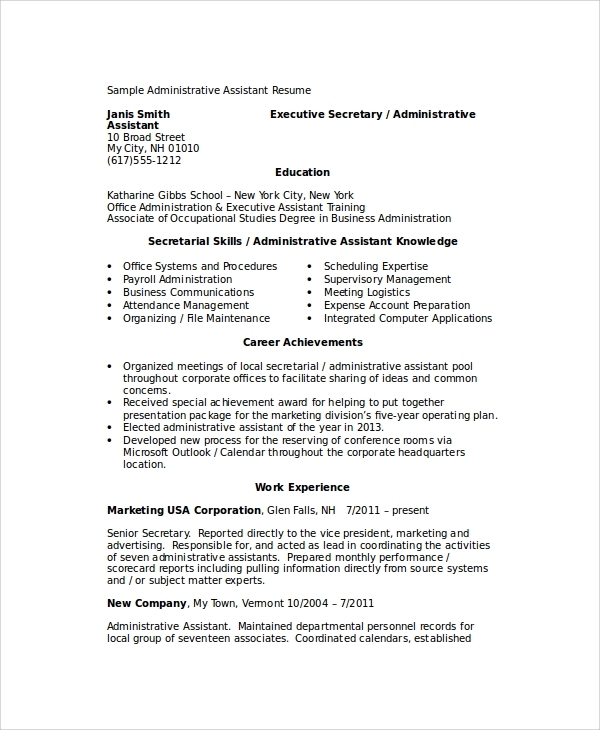 This is a complete format and sample for the senior Administrative Assistant resume. It contains a description of professional experience with detailed timelines. Then it has provisions to highlight the strengths and skills and areas of expertise. 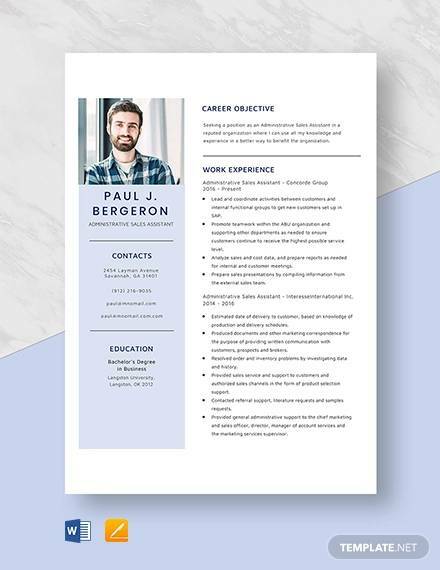 It comes with a beautiful layout for the resume. The targeted audiences for the Administrative Assistant Resumes are those fresh graduates who have done their degree courses on administration and are willing to apply for an administrative assistant post. Similarly, even experienced assistants can apply for a senior administrative assistant post using the above resume samples. 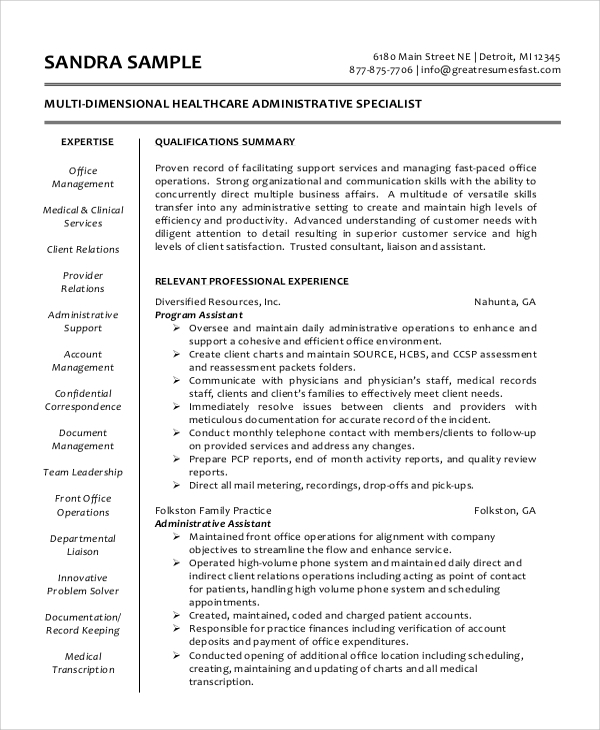 There is medical administrative assistant resume for medical representatives and assistants. Administrative assistant resumes are useful for the fresh graduates who have a degree in administration. The above-listed Sample Resume will help to guide them to prepare a strong resume by following them. They have all the ingredients to impress the interviewer who will be going through the resume to decide to give a call for the interview. You can easily overcome your competitors with them as they are professional, tailor-made and clean.